There are times in life when we might feel totally hopeless, helpless and overwhelmed with emotional pain. It can seem like there is no other way out of our problems, we've run out of ideas and possible solutions. Our problems seem unfixable. The pain feels like it will never end. We believe we've run out of options, and suicide is the only answer left. Suicidal thoughts can result when we experienced too much pain, without having enough resources to cope. 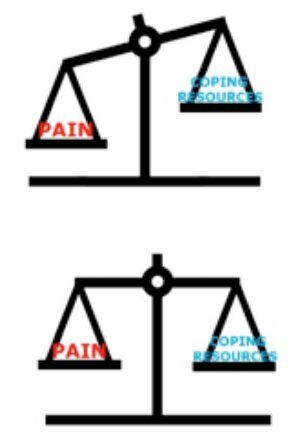 Even though the pain can feel overwhelming, there are things you can do to help reduce the pain. Vision: watch a favourite film or programme, look at something nice in nature, or at a picture or photo you really like. Hearing: listen to music (but not anything that you know makes you feel sad), get outside and listen to birdsong, trying singing some of your favourite songs. Smell: put on your favourite scent, wash your hands with a nice smelling soap, find a food that smells nice. Taste: use the sense of taste to focus your attention, eat slowly and mindfully, enjoying each mouthful. Touch: find something comforting to wear, stroke a pet, cuddle someone or something – e.g. a soft toy or pillow. Breathe slowly, concentrating on breathing in through your nose and out through your mouth. Listen to a relaxation CD or app, or find relaxation techniques online, such as these: sittingtogether.com/meditations.php. Whilst it seems like they help for a while, they will make your problems worse. Are these thoughts facts or my opinion? What has helped me feel better in the past? What can I do right now that will help me feel better? What gives my life meaning? What are my goals, dreams or life values? e.g. Family, friends, helping others, faith, connecting with nature. I've coped this far, I can get through the next .... (day, hour, 10 minutes). Things will look better in time. Depression is temporary - this will pass. Depression is distorting my thinking - these thoughts are the voice of depression. They are not facts. I don't have to act on them. The vast majority of people get better from depression. I will look back. It might feel impossible, but there are lots of things you can do to help you cope. Some of them are quite big things, others are small and easy to manage. You only need to get through the next hour, then the next day and the next week and so on. Focus on the next step – on getting through the next few minutes. Make sure you remember to eat and drink healthily, avoid drugs and alcohol, get enough sleep and take regular exercise – all of these help to improve your mood. Call a friend or family member; a helpline – e.g. the Samaritans, go somewhere you can be safe and with other people, call a health professional or go to the Emergency department of your local hospital. Life can feel more manageable if you have a set routine for each day: get up at the same time each day and aim to go to bed at the same time each day – plus plan in activities for the morning, afternoon and evening. Do things you enjoy doing – or used to enjoy doing and make sure there are things in your day which help nourish you, instead of having your day either empty or filled with things that drain you and leave you feeling low. Often, we try really hard to get everything done and expect far more of ourselves than we would of other people. Sometimes, to help us cope and make life seem more manageable, we need to slow things down and reduce the struggle. It’s not giving up or giving in, it’s a way of helping us keep going. There are a number of local support services in Stockport that can help you. Confidential listening service for people 24 hours a day, 365 days a year. Talk to them any time you like, in your own way, and off the record - about whatever's getting to you. Provides a range of effective, evidence based help and support to anyone with a GP based in Stockport aged 11 years and over. Contact 0161 480 2020 or visit www.stockportpws.org.uk for more information and to refer yourself. Confidential counselling service for people over 18 covering depression, anxiety, stress, bereavement and loss, relationships, family breakdown, trauma, childhood abuse, domestic violence and abuse. ➤ The "I feel so bad I can't go on" booklet gives you tips about staying alive - even when you might not want to. It also helps you image a life when you start to feel good again - because you will. ➤ Staying Safe is a slideshow written by a group of people including professionals supporting suicidal people, people who have got through tough times and people who have supported their own friends and family. ➤ The Recovery Letters are all written with the intention to try and alleviate some of the pain of depression, to make the loneliness slightly more bearable and above all to give hope that you can recover. ➤ U Can Cope is a 20 minute film made by people who feel suicidal and talks about what they did to cope and recover. ➤ Counselling Directory connecting you with professional support. The online directory helps you find a registered counsellor or psychotherapist in your area of choice.